PM-3 Declassification of Information and Diligent Effort: The POW/MIA Committee monitors the actions of the National Declassification Center. More than 530 cubic feet (598 boxes) containing records of various Army commands and secret correspondences have been declassified. The House Committee on Armed Services has directed the Secretary of Defense, as part of the reorganization of the Defense POW/MIA Accounting Agency (DPAA), to submit a report to the House and Senate Committees by March 1, 2016, identifying specific inefficiencies in the declassification process that hinder recovery efforts. PM-4 Americans Missing in Laos and Cambodia: Efforts continue to improve relations with Laos and Cambodia to further recovery missions there. DPAA Director Mike Linnington has visited Vietnam, Laos, and Cambodia, three major countries of the Vietnam War. While in Laos, he visited DPAA and Lao personnel conducting field operations.The POW/MIA Committee was informed of the activities. PM-7 Possibility of Live POW/MIAs, and Facilitating the Return of Those Who Remain in Southeast Asia: VVA has formally acknowledged the possibility of live Americans being left in Southeast Asia at the end of the Vietnam War, and elsewhere worldwide as a result of later military operations and war. Until all known missing in action from the Vietnam War are accounted for and returned, no change to the resolution is foreseen. PM-8 Fullest Possible Accounting of POW/MIAs in Vietnam: The POW/MIA Affairs Committee continues to receive timely information from DPAA and other organizations regarding accountability of the missing in action from the Vietnam War. The names of all identified MIAs are immediately announced through mass media. For various reasons, including wishes of the families, DoD announcements are often delayed and sometimes are never made. PM-11 Honoring All Returned POWs, and Giving Recognition of American Civilians Held as POW/Interned During WWII: VVA urges all chapters and state councils to seek opportunities to honor local ex-POWs and their families. In addition, VVA desires that Congress enact legislation to formally recognize the sacrifices of these individuals. VVA commends the extraordinary service rendered by those public servants, military personnel, and citizens who have devoted their lives, vocations, time, and personal resources to resolving the issue of prisoners and missing from the Vietnam War and other conflicts. PM-13 Public Awareness and Education on the POW/MIA Flag: VVA will continue to educate public officials and others on the history and meaning of the POW/MIA flag and its proper display under P.L.101-355. Every VVA function that displays the national colors must include the POW/MIA flag. The POW/MIA flag will be posted to the immediate left of the national colors.All other flags in the display shall be flown to the left of the POW/MIA flag, following standard positioning protocol. 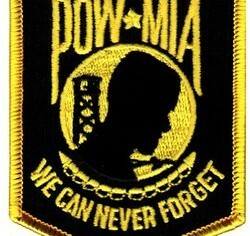 PM-14 Forever POW/MIA Stamp: H.R.3558, the Perpetual POW/MIA Stamp Act, was introduced by Rep. Gus M. Bilirakis on September 18, 2015. To date there are only ten co-sponsors. VI-1 The Veterans Initiative, A National VVA Effort on Vietnam’s Missing in Action: In an effort to receive more information about the Vietnamese missing in action, the committee created a new public service announcement, “The Veterans Initiative Needs Your Help” . The end result of this veteran-to-veteran collaboration between VVA and Vietnamese organizations hopefully will be the return of Americans missing in action. VI-2 Scope of the Veterans Initiative: The primary mission of the Veterans Initiative is to achieve the fullest possible accounting of all POW/MIAs in Vietnam and Southeast Asia. Chapter 1068 Reviews Vietnam War Novel F.N.G.